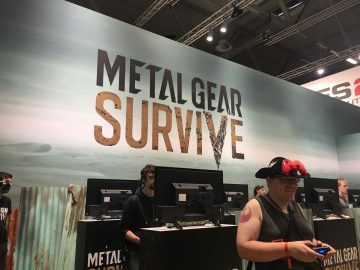 Konami tasked Jelly with developing two booth designs for Gamescom 2017 to support the promotion of their latest titles: Metal Gear Survive and PES 2018. Creating designs for print involves a rigorous drafting and approval process before the final product makes its debut. This case study will explore the process of creating these large scale, promotional designs from a designer’s perspective. The very first step in creating a design is receiving the brief from the client. 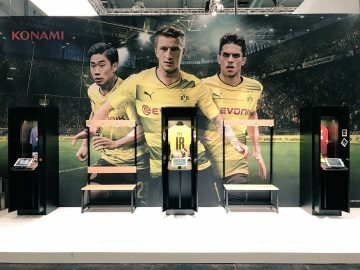 In this case Konami sent over a detailed brief including scaled 2D drawings of how they wanted the booths to look. Whilst Jelly’s own design team comes up with the final design, the client’s mock-up consists of a general overview and details the guidelines for the project. 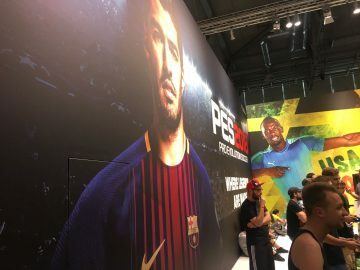 Both booths came with their own set of requirements but the PES 2018 booth had a much stricter set of guidelines since it incorporated design elements from both the client and its partner football clubs’ products and branding. When print designs are set to appear in another country, Jelly’s designers have to work closely with local printing companies, tailoring design work to their specifications. These particular designs would be appearing at Gamescom Cologne and required all artwork be created at a scale of 1:10 whilst ensuring the designs remained at as high a resolution as possible so as not to lose clarity when scaled up during the printing process. After carefully considering the brief, Jelly’s design team will sketch out the initial artwork on paper to get a rough idea of composition, scale, and how they intend to incorporate vital information and branding. Once a sketch design has been solidified the lead designer begins to work on artboards in Adobe Illustrator; these will form the base of the print ready artwork.  Following this, background artwork is then created and scaled in Adobe Photoshop. The design goes through a couple more adjustments in both Illustrator and Photoshop until the designer is happy. Designs such as these are subject to a rigorous approval process. The client provides an initial idea of what is required but this often changes between the start of the project and the deadline. The PES 2018 booth is a perfect example of a design with multiple stakeholders; all of whom take part in the approval process. 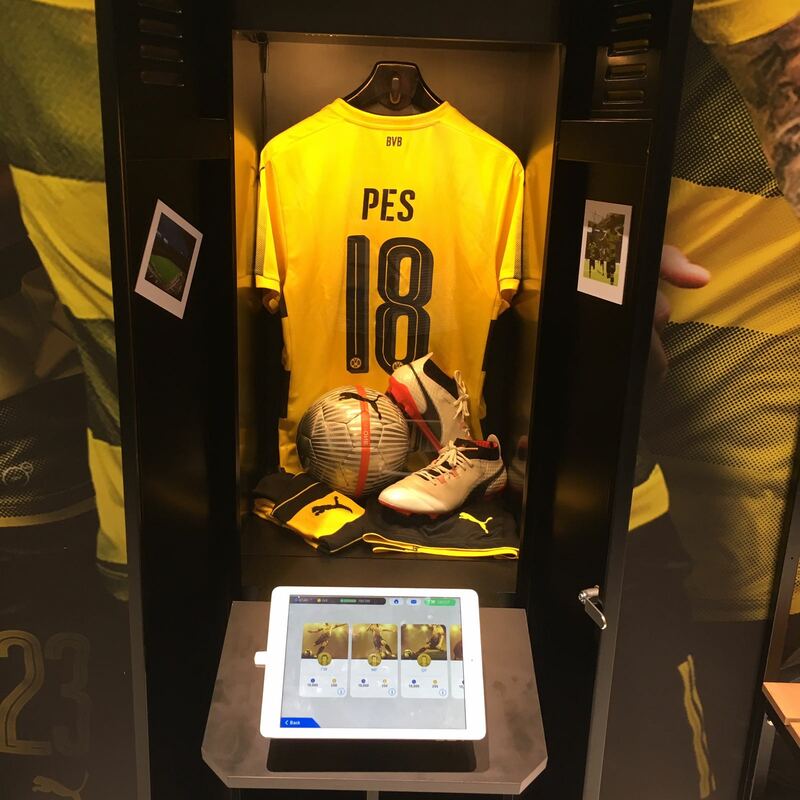 Events such as player transfers, sponsorship deals, and certain promotions for the partner clubs risk deviation from the brief and can impact the final design. Variables such as these can sometimes lead to edits being made right up until the final deadline. In this instance, the PES 2018 and Metal Gear Survive booths were approved in good time with a minimal amount of back and forth between Jelly, the client, and the partner clubs. Once the artwork is approved it is sent to the printers who are responsible for the physical construction of the designs. The next time Jelly sees the design will be when it is live at the event. 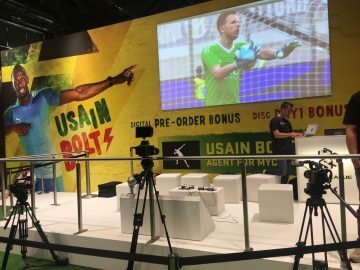 The final designs appeared as separate booth areas on the Gamescom 2017 show floor. Each booth encompassed an open-plan game demo area where members of the public were invited to experience the upcoming Konami titles pre-release. The booth designs were instrumental in driving traffic towards the booths, with many members of the public stopping to take pictures against the booth backdrops. 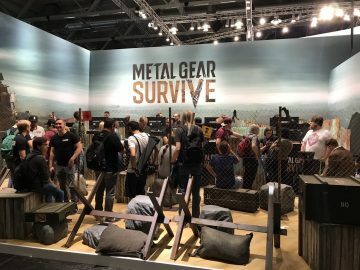 View the Metal Gear Survive and the PES 2018 booth designs in the gallery below. Do you have a digital or print design you’d like to see brought to life? Jelly’s specialises in creating impactful visual media that can be tailored to fit a range of platforms and devices. Get in touch at hello@jellymedia.com or give us a call on +44 (0) 1253 885581.